Whenever a government assesses “the” value of a property for tax purposes; whenever you project figures in a pitch to investors; whenever an accountant writes a single number on a line that isn’t referring to Cash Itself — a distribution has collapsed. I put “the value” in scare quotes because one number can’t express an asset’s worth. Even if dollar-value-to-me is a 1-D concept — a dubious proposition itself — there are still many other players who value the asset differently. And those valuations could change with new laws, market conditions, reading a book and getting a crazy idea, etc. It all depends. It’s a function; it’s multi-dimensional; it has a topology; different opinions = different metrics, and so on. Anyone who has done accounting in the real world knows intuitively that Numbers Aren’t Facts. Numbers are opinions. Numbers are estimates. Numbers are vague, but less vague than the alternative. Let me delve into the economics of one imaginary ambiguous valuation for the more scholarly readers. Imagine a farmer who owns land in Montana and has worked it all his life — never considering selling the farm because he loves farming, is a farmer, sees himself as a farmer, and wouldn’t know what to do with himself if he didn’t farm. He wants to pass the farm on to his kids, but the property will be subject to taxes as it passes from hand to hand. How much should the government tax his land asset? They have to estimate the worth of the property and then charge a fair, fixed percentage that they would charge to anyone else. But there is no single worth of the property. It’s worth different amounts to different people, for different reasons. In the hands of his kids, and in his hands, it has sentimental value. In a farmer’s hands, it has agricultural value as well as the utilitarian pleasure the farmer gets from working the land. In a real estate developer’s hands, if the developer does everything right and sells a good number of lots, the property will be worth a lot of dollar bills. In a rich fool’s hands, the property is worth as much as he thinks it’s worth. In a rich sentimentalist’s hands, the property is worth whatever s/he has to pay to acquire that beautiful thing. In a conservation fund’s hands, the property’s worth will fluctuate with the carbon price, donations (which in turn will fluctuate with certain segments of the economy), grant money, the fund’s ability to obtain other nearby properties, the priorities and opinions of the Board of Directors, and the migratory patterns of endangered species. The farmer may want to live in his own universe where he works the land, his kids work the land, their own little economy — but the tax man’s assessment will definitely look at what other people outside that universe are willing to pay for the property. 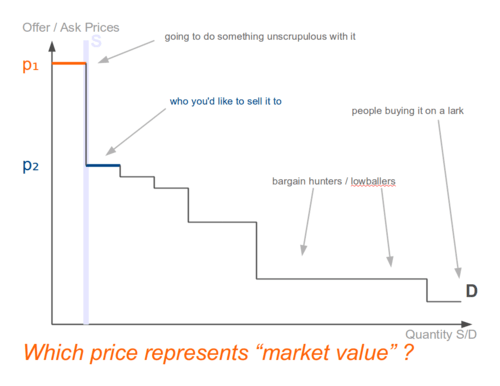 A Marshallian supply & demand graph from Econ 101 makes the point. This is a 1-D chart so it doesn’t capture the full variegation of the stories I sketched above. But it shows more detail than a single number “the” value of the property. The farmer only has one of “good X” to sell, so supply is inelastic. In Econ 101, the market clearing price is the price which makes all units ship. In this graph there are multiple prices which would make all units ship, so there is no single market price. In the family farmer situation, the farmer doesn’t even want to put his place up for public auction. But the ambitions and tastes of some rich guy or group of rich guys can still sway how much tax the farmer pays handing the property over to his kids. 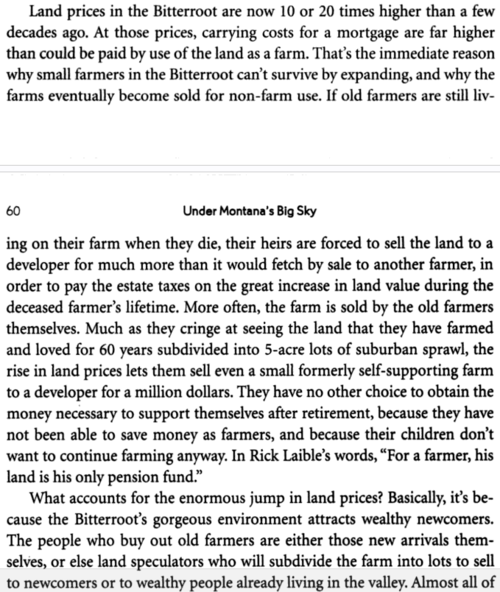 The farmer can choose whom he sells it to (and refuse to sell to a developer for instance), but that preference has no effect on the tax rate. The family farm story isn’t the only case where a unique asset has to be assigned “a” single value. Selling a restaurant — will the next owner sell alcohol there? Shares of Bear Stearns around February 2008. Any asset I buy for use in my business. Obviously I wouldn’t buy $10M of factory equipment if I didn’t think they would be worth much more than $10M to me. But their value in a liquidation would have to be lower, especially if the buyers know the liquidator is under time pressure and can’t use the stuff any other way. Everything is connected — fortunately or unfortunately. This entry was posted in Uncategorized and tagged 4-D, accounting, assessment, competitive bidding, economics, estate tax, facts, farming, Jacobian, nepotism, noncommutative, property, real estate developers, selling a business, supply & demand, taxes, tenders, wave collapse. Bookmark the permalink.